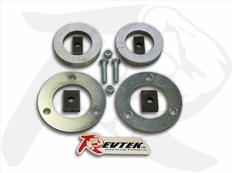 This RevTek Suspension front leveling kit achieves lift for your truck with a strut spacer. You'll need to compress the factory spring in order to install this spacer. The part number for this RevTek Suspension front lift kit is RevTek 315 and it fits 2007-2017 Chevy Avalanche Suburban Tahoe and GMC Yukon Denali 6 Lug models. It lifts the front of your truck 2", giving your truck a level stance and allowing you to safely run up to a 33" x 12.5" wheel .